Egyptian ship made of papyrus is one of the ancient in the world. Firstly it represented itself only a papyrus raft and to about 3500 year B.C. it became already a real ship. The ship was used only for navigation on the river Nile. Her bow and her stern were raised specially to pull her across shallows. But foreseeing the possibility to raise the bow and the stern higher with the help of ropes, Egyptians started their voyages at sea. The known expeditions of Tour Heyerdal on the papyrus rafts Ra-1 (1969) and Ra-2 (1970) showed that papyrus could stand two months of seafaring. Of course, Ra-1 had sunk earlier but it was due to great roughness at sea and the fault of the crew who did not pull the rigging steering the curve of the stern. On Ra-2 the stern was raised sufficiently from the very beginning of the seafaring. Ra-2 departed and in two months she reached Bridgetown, the capital of Barbados. Constructively Ra-2 was made of short papyrus bundles as they saturated less water. Bolivian Indians from the lake of Titikaka built Ra-2. From ancient times up to nowadays they navigate on such cane vessels calling them 'totorus'. Egyptian sailing ships were built by binding together papyrus bundles and the thickest of them were placed on the outer surface of the vessel. The sail was square. It was made of cloth or papyrus. It was hung on two yards, which were tied together to make them longer and which were fastened to the two-legged mast. At moving downstream the Nile there was always a head wind and at upstream navigation there was a strong flow so the sail was useful. 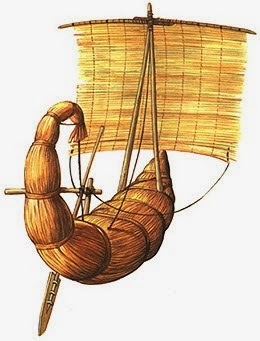 Rafts and vessels of such a type are used nowadays in the Eastern Africa, Persian Gulf and South America.